The Horsehead Nebula (also known as Barnard 33) is a dark nebula in the constellation Orion. The nebula is located just to the south of the star Alnitak, which is farthest east on Orion's Belt, and is part of the much larger Orion Molecular Cloud Complex. The nebula was first recorded in 1888 by Scottish astronomer Williamina Fleming at the Harvard College Observatory. The Horsehead Nebula is approximately 1,500 light years from Earth. It is one of the most identifiable nebulae because of the shape of its swirling cloud of dark dust and gases, which bears some resemblance to a horse's head when viewed from Earth. The red or pinkish glow originates from hydrogen gas predominantly behind the nebula, ionized by the nearby bright star Sigma Orionis. Magnetic fields channel the gases leaving the nebula into streams, shown as streaks in the background glow. A glowing strip of hydrogen gas marks the edge of the massive cloud, and the densities of nearby stars are noticeably different on either side. The heavy concentrations of dust in the Horsehead Nebula region and neighboring Orion Nebula are localized, resulting in alternating sections of nearly complete opacity and transparency. 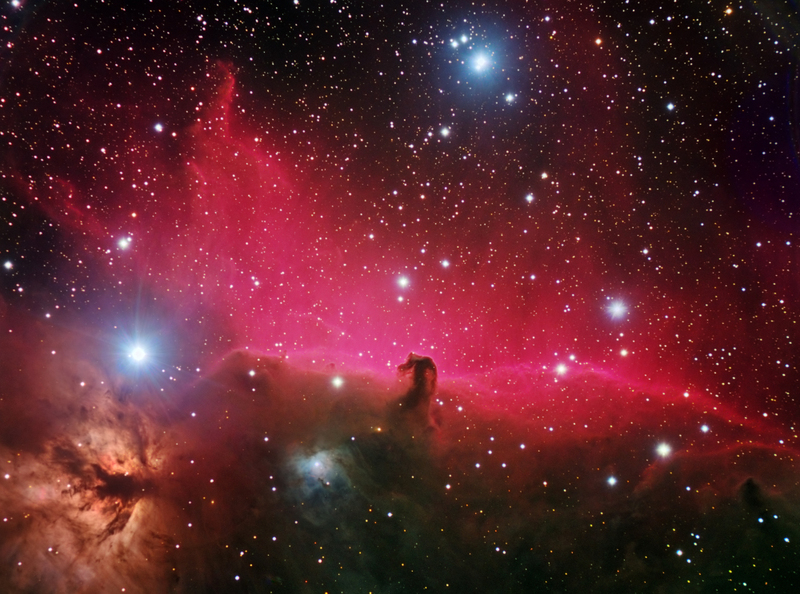 The darkness of the Horsehead is caused mostly by thick dust blocking the light of stars behind it. The lower part of the Horsehead's neck casts a shadow to the left. The visible dark nebula emerging from the gaseous complex is an active site of the formation of "low-mass" stars. Bright spots in the Horsehead Nebula's base are young stars just in the process of forming.